As everyone else I am in shock - I can't believe that such a talent has been taken from us. 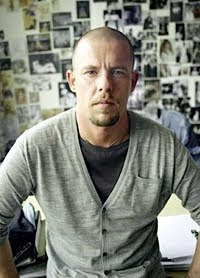 Ever since he launched on the fashion scene he has been an inspiration and contast wonder to all in the fashion world. I remember seeing him in Harvey Nicks a while ago and I never ever go upto celebrities and gush but with him I couldn't help myself and true to form he was very sweet and humble. The fashion world will truly miss his genius.